I am so heartbroken abut this news. I met George when I was 17 and had my heart set on going to Berkeley to major in journalism and become a reporter. The second I met him on a high school field trip with my school newspaper, I knew that I had to be at Cal Poly where he was. He was a constant mentor to me and gave me such a hard time about graduating early. He’s shaped a lot of who I am and where I am now today, a news producer at The Seattle Times. Rest in peace, George. You touched the lives of everyone you met. Condolences to all that knew Mr. Ramos, it sounds as if he was a good man with many accomplishments. Gone too soon. What sad news for the Central Coast; his role here as editor will surely be deeply missed. 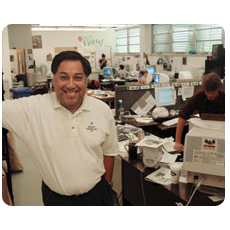 My condolences to all who knew him, especially Karen Velie and Dave Congalton among the others connected with Cal Coast News, and everyone up at Cal Poly. Listening to him when he was on Dave’s show brought across some of his humor and wit and all of us here in the area will miss him whether we know it or not. Stacey, I am sure that you will be able to “step up” and do a good job in George’s absence, good luck to you. So sorry to read this. Sincere condolences to family, friends and CCN staff. This is a terrible loss to so many. My condolences go out to his family and all who loved him. It was a terrible shock for Karen to find him, one never really expects that their concern over an absent friend will materialize into a worse case scenario. I send her additional special well wishes as she along with many will miss George Ramos for a long time to come. Rest in Peace George and thank you for all your selflessness during your journey to bring light and transparency to the mass. Very sad news. Condolences to both family and friends. Our thoughts and prayers go out to his family both biological and professional. My sincere condolences goes to friends and family of Mr. Ramos as well as the staff at CCN.